Let your mind wander to a scene of foamy water, rhythmically crashing into rocky cliffs. Each out-tide exposes an outcrop of jagged earth cloaked beneath the deep-blue ocean. It could be serene, or it could be an illustration of the power of the Earth's bodies of water. Balinese artisan Made Sadia designs and crafts a stunning representation of tumultuous tidal-surges that fits on your desk with this handcrafted vase. 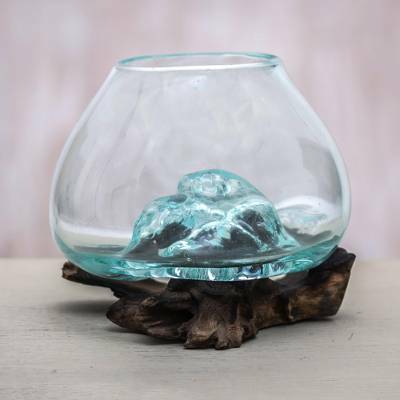 Beautiful albesia wood is reminiscent of jagged rocks, while clear, handblown glass takes on the nature of the tides for an eye-catching, decorative piece that is the perfect addition to your home. Because each vase is handmade, shape and size can vary slightly and tiny bubbles may appear within the glass. This exemplifies the hand-blown technique, making every piece a unique example of blown glass craftsmanship. Vase: 12 cm H x 17 cm Diam. Vase: 4.7" H x 6.75" Diam. "I'm a married man. I really love my wife Nuliyati and we've been blessed with two sons. Having children pushed me to be a hard worker and focus on our future plans…." "I was born in 1966 to a family of farmers in Bali. I'm the younger of two children. We had to work from the time I was still an elementary school so we could pay our school fees ourselves. "Our town is famous with its art forms such as the paintings and wood carvings produced by the people here. "I'm a married man. I really love my wife Nuliyati and we've been blessed with two sons. Having children pushed me to be a hard worker and focus on our future plans for the sake of my family. "There was a time when we were in a very limited financial situation, but my family encourages me to be stronger and tougher so finally we'll be able to pass the hard times. Always keep fighting, be patient, and pray to God for the best. "Before becoming involved with the arts, I was just a paper boy. Today, I'm more interested in the furniture while my wife works in wood carving. "Furniture has great potential in Bali since we have many hotels, villas and restaurants. At first, I just received commissions from customers and produced their designs but now, years later, we are able to craft our own original designs, as well. "I work with the help of three family members and eight assistants. We use only common traditional tools like hand drills, hand saws and hand polish-machine. We are trying to create new designs with innovations."